Nobody needs convincing that it’s good to know foreign languages. But finding a good school is not such an easy task. What criteria should we use, what should we pay particular attention to? We hope that this short guide will help you make the right decision. A teacher who is a true professional is the foundation of a good learning experience. Apart from knowing the language really well, a good teacher should also have thorough methodological training in how to teach foreign languages. They should also have a positive attitude towards their students, be creative, be good at listening, and interested in the world in general. It’s important to find a group that suits our language level and specific needs. Before we’re assigned to a group, we should be asked to complete a placement test and invited to talk to a methodology specialist – this is important, as this interview is not only a chance for us to check our language level, but also to voice our expectations! It’s worth remembering that the placement test is not for a grade, so we should try too hard to get the best possible score: learning in a group at a level that is too high (or too low) for us is actually not a good idea and usually leads to frustration. Also, learning in a general language group, where the aim is to learn practical, everyday communication skills, is quite different from preparing for a specific exam, where apart from developing language skills you also practice specific test techniques. It’s also important that the group be small: 4 to 6 people is the optimal number for the teacher to be able to get to know and to listen to each student, for him/her to have enough time to explain a language point and then to organize interesting speaking tasks, pair work, and group games. In a good language school textbook use is supplemented with additional handouts, lots of games, and, at higher levels, with authentic materials brought and prepared by the teacher to suit the needs of a specific student or group. More than anything else, learning a language requires systematic effort. It’s great when the teacher gives us a few tasks to complete at home, and encourages us to work regularly. In a good language school, we will get plenty of extra practice materials. It’s important that they be interesting and varied! It’s a definite plus if the school, apart from regular courses, also organizes workshops and offers additional conversation opportunities. This is where you get to meet other students (and not just from your own group), exchange opinions and experiences, listen to different accents, and simply do something together. Things like cooking classes, evenings with board games, film nights, and sightseeing in the city all give you a chance to practice your language skills in real life situations. A good school should provide opportunities to continue learning even if we move to a different city. Skype lessons, for example, let you continue regular language work even in a place without language schools. Another interesting option is on-line materials and videos provided by the school: these can supplement classroom learning, or can be used as a way to stay in touch with the language when we are off on holidays, for example. 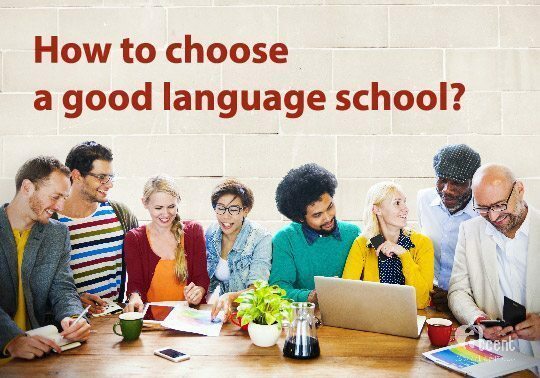 When choosing a language school, it’s good to remember that the cheapest option is not always the best. Professionalism has its price, and sometimes it’s worth it to pay more and in exchange get the assurance that our course will give us a lot of satisfaction! Before making the final decision, it’s a good idea to visit the chosen school, meet the secretaries and the teachers, ask about the details, look into the classrooms, and see the library. All this to make sure that this is really a place where we want to spend some time.